I had an arborist come to check the health of an old Elm tree in our front yard that has been dropping a lot of branches. He said the tree was in good health but suggested mulching around it to increase the amount of moisture it was able to hold and that may reduce the amount of branches it loses. 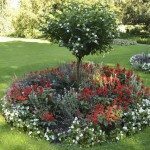 The tree is fairly close to the street and another flower bed so it would look odd to put a ring around it so I decided the best option was to extend the existing bed to include the tree. The problem I have run into is the tree has large, exposed roots that extend anywhere from 6-15 feet out into my yard. My plan was to extend the bed 8' past the tree to include a majority of these roots, but it is not possible to extend the bed far enough to include them all. All of the existing beds in my yard, including the bed I'm expanding around the tree, are edged with black plastic edging so I had planned to continue with that rather than create a mish-mash of materials, but now I'm stuck on how to dig for the edging without damaging the tree root. Any suggestions would be greatly appreciated. Thank you! You will not be able to put an in=ground edging here. You will have to use an above ground design, and likely keep it as its own area. It will be impossible to dig without killing the tree. Other than this, I fully agree that mulching can help here.